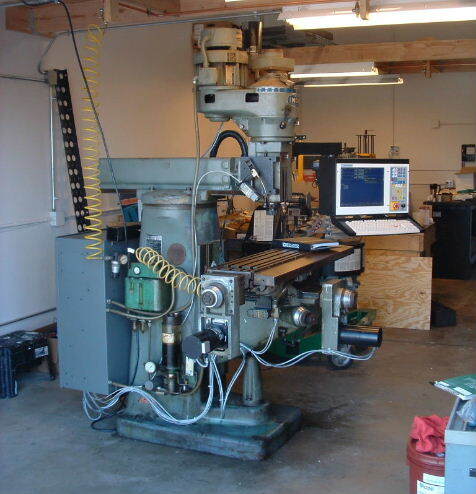 This is a Centroid M400S retrofit to a 1978 Wells Index CNC knee mill, completed by CNC Services Northwest in April 2005. The Centroid control cabinet is mounted on the back of the column. The console is on an offset arm mounted to the right side of the ram. The new servo motors bolted to the original motor mounts with no modification. The original pulleys were pinned to the shafts of the old stepper motors. We broached 3/16" keyways in them to fit the new motors. The original limit switches worked nicely once they were cleaned and lubed. The spindle is a Universal Kwik-Switch 200. The original spindle taper was worn and did not clamp tools properly. I sent the quill back to Wells Index (A&D Machinery), who installed a new spindle. Even after 27 years this machine runs smoothly and holds tight tolerances! 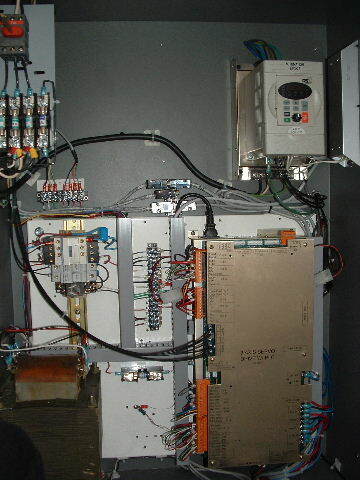 This is a standard Centroid M400S high power (230V) cabinet, with a 2HP inverter and accessories in the upper right. The machine and control run easily on 230V 30A single-phase power: ideal for a home shop or other non-industrial setting.